Direct-to-Consumer Telemedicine: Has its time come? It was 1999, and I was speaking at a prestigious academic center’s ‘Innovations in Dermatology’ symposium. I presented work we had done on a web application that would allow a non-dermatologist (primary care doctor or other front-line provider) to upload images of a patient’s skin as well as some history. Subsequently, a dermatologist could review both the history and the images and enter a diagnosis and recommendations on the same website. My talk was greeted with intense scorn by one audience member (“You are cheapening our specialty,” he told me) and general lack of enthusiasm by most of the others. Fast-forward to 2014. Dermatologists share digital images via email and a number of social networks thousands of times a day. If the specialty is cheapened, I can safely say it is not due to this activity. So far, we’ve not created any ‘cutaneous radiologists’ which was another fear of nay sayers at the time. In fact, the American Academy of Dermatology has an officially sponsored software application that members can use to provide volunteer teledermatology services to underserved clinics, and is planning on promoting this concept in the coming year. What a difference 15 years makes! I use this story to set context for a thoughtful discussion on one of the most controversial telemedicine questions of our current time. Is it safe and effective care for providers to evaluate and prescribe for patients that they’ve never met face-to-face? Join me in thinking through this question. 1. Most health care requires authentic relationships. You don’t have to go very far to find graphic stories about folks who form relationships online. These relationships become quite ‘close,’ then the parties meet face-to-face and find that one or both was being highly deceptive with their online persona. It seems safe to conclude that the possibility of fraud in online relationships is much higher than in person. Most clinicians feel that forming a relationship with their patients is a core part of providing quality health care. Until this authentication challenge is solved, it’s hard to imagine many health care interactions with new patients being conducted in an online environment. Some of you may be thinking that ubiquitous, embedded videoconferencing solves this and certainly adds a great deal of value beyond text-based interactions. But I don’t know if we can say applications like Skype and FaceTime are the complete answer. 2. How do we define quality care in this new environment? When you go to a hotel, you expect clean sheets and towels, a warm shower, a bed you can sleep in, and comfortable room temperature. What are the same minimum quality requirements for an initial doctor’s visit? As doctors, we’re taught that this includes a complete medical history and physical exam relevant to our specialty. As a dermatologist, I am not expected to do a complete neurological exam (you should be thankful for that) but unless you decline, I am expected to do a complete skin exam, even if you come in for a 4 X 4 cm patch of poison ivy on your arm. This is something that I really cannot do online, even with current state-of-the-art technologies. The idea of allowing patients to upload images of body moles or facial acne for evaluation by providers they have not ever met gives many of my colleagues great consternation. (Even more controversial are image analysis scientists who are creating applications that can analyze these images without human intervention. More on that phenomenon at a later date.) My colleagues fret that a patient will send them an image of a mole that is benign, but ignore a mole that is an incipient melanoma. To me, this seems less onerous than the authentication issue. Patients are capable of managing their own risks when these risks are spelled out. For example, it seems perfectly reasonable to alert an individual that she may be missing an important lesion if she chooses to submit an image over the Internet, rather than come in for a complete exam. A closely related fear or objection is one of physician liability. In this context, the doctor is not only afraid they will provide substandard care by not doing a complete physical exam, but that they may be held liable for that omission. Once again, spelling out that a patient is taking accountability for those aspects of his care not addressed in an online interaction seems reasonable to me. I think the liability concerns are overstated. 3. Is the technology up to the task at hand? There is not a general yes/no answer to this question. It is medical problem specific. The answers are in the realm of clinical research. Taking you back again to the late ‘90s, we (and many others) did painstaking clinical studies to empirically test whether a set of digital images is of sufficient quality to be a diagnostic tool in lieu of an in person exam. There now exists a body of literature that demonstrates this equivalency, with the possible exception of some pigmented lesions. We also carefully examined the feasibility that patients could take their own, clinically accurate, facial images of acne. Are there other examples? Can a psychiatrist do an initial evaluation of a patient via interactive video? I am not up on this literature, but my guess is that it has been studied and the answer is yes. There are probably a few other examples as well. 1. Identify a medical problem that has a diagnostic data set, easily and reliably acquired by a consumer/patient. 2. Assure that the patient is capable of understanding that the online interaction is problem specific and may carry risks, particularly for omission of care involving other health problems. 3. Assure that the treatment decisions for the specific condition at hand are algorithmic and do not require an authentic relationship (i.e., the problem is transactional or of low emotional value to both provider and patient). This is exactly what some folks have done with two fledgling companies, Direct Dermatology and DermatologistOnCall. They accept images of facial acne and if they are comfortable making a diagnosis, will prescribe a limited array of therapeutics for these patients. Both are gaining some traction, indicating that there is consumer demand. Interestingly, since acne images involve the face, it makes it much less likely that an individual can assume a fraudulent online personality. And even if they decided to have their friend send in facial images what would be the point — to clandestinely procure a prescription for a topical antibiotic? I’d say there is not much risk on the authentication side in this model. Another interesting comparison is the rise of retail clinics. These were initially scorned by primary care providers, but consumers are drawn to the convenience. The repertoire of problems is limited, as are the therapeutic options. Patients are made aware of these limitations and the associated risks. Perhaps Direct Dermatology and DermatologistOnCall are the vanguard of a new set of medical services that are like retail clinics but delivered in an online environment. I’ll watch their evolution with great interest. And I think the risk of cheapening our specialty is low. Reblogged this on Between The Charts. In the world where care is being taken by patients themselves by reading online and asking questions to an unknown doctor, the liability terms starts diminishing. Suppose a doctor advises a treatment or an investigation and the patient can deny it. So the patient himself is accountable in such a case even if complications arise in future. Similarly if a patient sends an image to a doctor and asks to interpret the benignity the doctor would not be responsible for not doing the complete skin examination. Here the patient is looking out for online doctor or teleconsultation. I like the way the blog is written concerning the points of contemporary practitioners who fear about liabilities and optimum care rendered to their clinic patients. Great to hear of this ‘ahead of the rest of the market’ service. Offering direct-to-consumer teledermatology services is a pure form of “consumer-centric” care. It expands patient choice, enables unimpeded access to services, improves patient satisfaction and allows dermatologists to offer a broader range of clinical services. Dermatologists can now see and treat their patients differently and more effectively! 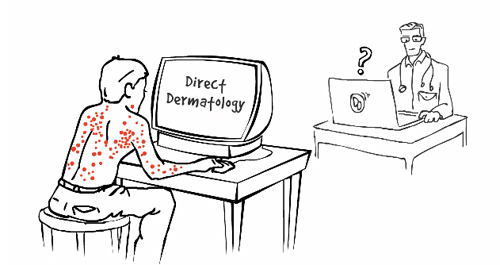 Direct-to-consumer telemedicine is an opportunity for dermatologists to manage common, low-risk, and non-urgent skin care online, triage procedural care into the office with greater efficiency and timeliness, provide a “spot-check” for new or changing lesions and reduce the “worry factor”, manage existing patients with chronic stable conditions more efficiently enabling in-office appointment slots to be used for those patients who really need them, and evaluate and manage acute care dermatology needs rather than having these patients go to express care centers. Finally, store and forward is the preferred modality of telehealth in dermatology, enabling a dermatologist to provide care on his or her time and within a work schedule. The timing of this market opportunity is perfectly aligned with technology and consumer preparedness. Patients know how to capture, store and forward high quality digital images based on experiences using social media platforms including Facebook, Instagram, Snapchat, and Pinterest. In addition, direct-to-consumer teledermatology plays to dermatologist’s strengths and training since we are highly skilled at understanding and analyzing images. Dermatologists are naturally trained “teledermatologists” because image analysis is a core skill necessary for successful board certification and recertification, continuing medical education, self-assessment, and maintenance of learning. How often are we asked by patients, family, friends and other colleagues to look at pictures they have taken on their iPhone or Android for an opinion? 1. Most healthcare requires authentic relationships. I completely agree with you: patients are capable of managing their own risks. A virtual health visit is not intended to be a substitute for a full body skin cancer screening. Patients can either voluntarily choose to use telehealth or may prefer to wait for an in-office appointment. At DematologistOnCall®, we have learned that 85% of online cases fall into 10 common diagnostic categories, acne encompassing ~30%. If a case can be managed by a telehealth encounter, then it should. The ultimate judgment, on whether or not the case can be managed online or a follow-up in-office evaluation is required, should be that of the licensed healthcare provider in light of the presenting circumstances of the patient. I also concur that the liability issue is overstated. To date, there has not been a teledermatology malpractice case and the discipline of dermatology literally ranks dead last in liability exposure compared to our colleagues practicing other disciplines in medicine. Dermatologists are liable for medical decision-making based on phone calls, faxes, curbside image review (from patients and colleagues) and emails, all of which may not involve a direct face-to-face encounter with the patient. In addition, approximately 40% of dermatologists are also shifting their liability for skin cancer screenings to non-physician extenders without ever actually seeing the patients. Direct-to-consumer teledermatology services are positioned best to serve patients within a local or regional area of the consulting dermatologist in the event additional testing, in-office diagnostic (e.g. biopsy) or a therapeutic procedure is required. Outcome studies show store and forward teledermatology to be just as diagnostically reliable as an in-office face-to-face encounter with a high management agreement (90-95%) between in-office based dermatologists and teledermatologists in outpatient and inpatient settings. Direct to consumer teledermatology platforms can extend access to nearly one quarter of the US population who live in rural regions within their state and care can be properly coordinated locally to the patient if the patient needs to be seen by another dermatologist or specialist (e.g. surgeon or plastic surgeon) that is available in that region if an in-office follow-up visit is indicated for procedural care. The American Telemedicine Association standards and guideline committee recently drafted (January 2014) “Core Guidelines for Telemedicine Operations” serves as an excellent review and guide to properly ensuring quality care within the telemedicine space. I completely agree that the greatest utility in offering direct to consumer teledermatology services involves workflow and platforms that capture problem-focused data sets by the patient, serves as a tool for managing common, low-risk medical dermatology or as a “spot check” by the provider; and importantly, treatment decisions are of low medical risk. The technology is up to task and in the future will only provide a richer care experience. Platforms must be scalable, reliable, available, secure, and maintainable. I believe these are all achievable. I do have concerns that some medical app makers are moving at a fast and furious pace without designing in the proper patient safeguards, preserving the opportunity for continuity of care, and ensuring proper communication or messaging between the healthcare provider and patient. In many instances, these “minimally viable” apps which may be fine for addressing a purely consumer market need, but, this is healthcare, where the quality and comprehensiveness of patient care should never be compromised. The health care consumer will demand and must feel certain that they are receiving the highest standard of care experience for their condition. Finally, some of these apps may be operating in states without properly complying with legal and regulatory requirements placing providers who utilize them for care at risk. At DermatologistOnCall®, it is core and fundamental to our mission that the care process between a patient and a provider must be in a sense “virtualizing” the same quality care a patient receives today in the physical world represented by in-office care by a board-certified dermatologist. We have carefully taken our years of analyzing and understanding what quality care should be in a virtual world and have worked vigilantly not to sacrifice any aspect of the care process in any manner. 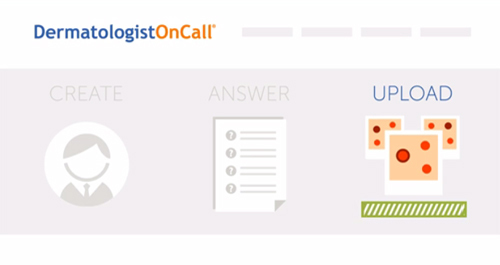 As a result, DermatologistOnCall® provides an easy, intuitive, quality care experience that both the patient and the provider can feel confident entering into and the care received represents the same outcome as if they had come into the office. Our vision is that healthcare through virtual care delivery can give patients the timely access to quality care that they so importantly need. Virtual care in harmony with In-office care is the future of care delivery and it’s a significant step in addressing care delivery in this country and across the world. Thank you for this thoughtful commentary! I am a Telemedicine Direct Sales Rep and Sales Trainer. I offer 24/7 concierge telemedicine for families and employees starting At 19.95 a month, whole household. A board certified doctor calls the patient back and answers questions or does a diagnostic consult. The future is here, we are one company of many. As an active and moderately savvy internet user, I’d like to comment on the first issue raised, that of the “authentic relationship”. My “authentic relationship” is with my primary care physician, the one whom 20 years ago I would have called my internist. I would never make a “cold call” via the web on a specialist, no matter how well regarded, without first discussing the issue with my primary and getting her thoughts. Ideally, the specialist is one with whom she’s worked before, or with whom she’s at least familiar. I can get much, perhaps too much, information on the web. What I cannot get is sound judgment from a person who knows me and my medical history. To act without that judgement is to be, as some called King James I, an “educated fool”. That is the only way we can cover all Americans and reduce healthcare cost.